Self-image originates in self-knowledge. As parents it is our responsibility to teach our children that self-image is the opposite of selfishness and pride. We often think that the child who can be direct or stand up for himself is destined for a bright future. (And we as parents expect those children to always have a smile on their face). Unfortunately that is not always so. Some of us would also believe that we may not refuse or say NO to our children as it would have a negative impact on their self-image. We might even believe that we should only use positive words like; sweet, very clever, champion etc. That they have a right to always say and do as they feel. Unfortunately that is called artificial, puffed up self-image. Why would I say that? Because the child who has never learned to accept NO would not be able to have respect for those in authority. Sometimes children with bad self-image have parents with bad self-image. Unfortunately it also happens that a child’s self-image gets damaged by negative feedback from others, for example at school. Here is an example from my practice. A lady of 68 years old (an accountant) could not accept that she is special, unique and the King’s child, because her grade 1 teacher put donkey ears on her when she could not answer a question. Here is another case. One child was struggling to write neatly. His teacher would ‘award’ a piggy to the child whose work was the messiest, so he often saw himself as a pig of the day. A child’s self-worth is based on his uniqueness as a person. When the child gets the message that certain aspects of his self-worth are not acceptable, it damages his self-image. Quite often the child will develop behaviour patterns to hide those things.For example, they become a clown, a perfectionist, a little angel or a bully. This is so sad, as it is actually a child’s way of protecting himself from pain. It is difficult for a child to admit that he doesn’t like himself. But it becomes apparent when the child expresses his unhappiness about the future, or compares himself to another child, perhaps a sibling. He believes that he is not good enough. It is true that children coming out of loveless environments often have bad self-image. It is there that the problematic behaviour gets developed in order to protect themselves from future pain.A child has two important emotional needs: to feel loved and to have a sense of achievement. I am sad as I write this, because often parents do not realise that their unhappiness can sometimes put too much pressure on the child. Children should be allowed to be children. It is heartbreaking that some households have rules about expressing emotions? A child would tell me: “I may not say how I feel. I may not get angry or cry. I may not be very happy, happy or a little happy”. Give them age appropriate freedom, responsibilities and independence within the family. You could even involve a child in problem solving. They should, where possible, learn to make their choices and learn that there are always consequences. We as parents should never deny our children’s negative feelings or pretend that they are nothing. For example, when your child says that he is stupid or a failure ,you should not change the subject. Simply reflect back the emotion to your child and ask him to tell you more. 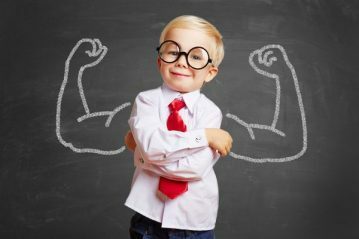 Dear parents, it can be very difficult to change a child’s negative self-image – but do not give up! The more your child learns about himself and understands himself, the better he will feel about himself. Even at a young age children should learn what their identity in Christ is. A sense of achievement gives children the feeling of “I can”. And so, how do we build a realistic self-image? Sometimes by pointing out your child’s shortcomings, sometimes by telling him about the wonderful talents he has received unconditionally. We also teach our children not to compare themselves to others or to look down on others. There is much more that can be said about a child’s self-image, but it for now remember that as Evergreen parents we are busy with discipleship that will bear fruit for someone else. You are precious to Him, because He created you. He knows your name. You name is written on the palm of is hand. He holds you in His hand – He upholds you. Nothing you can do or think of can ever separate you from His love. Marietjie Nel is a Pastoral therapist in her own private practice in the Western Cape, South Africa. She has a passion for the well being of children. She uses play therapy as well as her Evergreen Parenting principles to make a positive difference in the lives of people.